Israel has continued to deport Eritrean and Sudanese asylum-seekers to Uganda until at least January 2018, Amnesty International revealed today, despite statements by the Ugandan government that no agreement had been in place with Israel to receive them. New research by the organization shows that, once in Uganda, deported asylum seekers have not received papers, are without legal protection and remain vulnerable to exploitation, despite written assurances from Israel they would be protected. On 13 April 2018 the Ugandan government announced it was “positively considering” a request by Israel to relocate about 500 Eritrean and Sudanese “refugees”. Although the details of the agreement are unclear, the Ugandan government stated that asylum-seekers would “undergo a rigorous vetting process” before being granted asylum in the country. Amnesty International has collected new testimonies from ten Eritrean and Sudanese asylum-seekers deported from Israel to Uganda between February 2017 and January 2018. Seven of them are still in Uganda, while the remaining three have left for other countries in Africa. These testimonies show uniform reception procedures upon arrival in Uganda that raise serious concerns for the rights of those deported, including the risk of forcible return to their country of origin. Asylum seekers told Amnesty International that Ugandan individuals were waiting for them at the airport when they arrived from Israel and then escorted them out of the airport via back passages, circumventing immigration and customs checks. These Ugandan individuals then took the Israeli issued travel papers from the asylum seekers, leaving them with no visa or other document to show regular entry into the country. One of the deportees was told that their papers had to be sent back to Israel. Taxis then took them to a hotel in Kampala, where rooms had been paid for in advance for two or three nights. “It’s like a kidnapping” one Eritrean asylum-seeker described the experience to Amnesty International. Israeli officials have issued documents and given verbal assurances to deportees that they will receive a residence permit in Uganda to allow them to work and protect them from forcible return to their home country. Israel also gives them US$3,500 upon departure. Once in Uganda, however, asylum-seekers interviewed by Amnesty international found these promises to be empty. Their irregular migration status has left them at risk of detention and forcible return to their country of origin. One of the asylum-seekers interviewed by Amnesty International was arrested by Ugandan police shortly after arriving in the country together with five other deportees from Israel and beaten for more than three hours. “They were asking: ‘you are illegal, how did you enter the country?’ They took all the money we had from Israel” he told the organization. The group managed to pay the police to be released and left Uganda two days later. At least four of those who remain in Uganda tried to start the process to seek asylum in Uganda through a middleman, who asked them for money. One deportee gave US$400 to a middleman who promised him papers and then disappeared. At least three of those interviewed by Amnesty International expressed concern that, because they were from Israel, they would be rejected if they attempted to submit an asylum claim. One of the deportees told Amnesty International that he recently received a call from an Israeli immigration official, who asked him details about his current situation in Uganda. “I told him it’s very bad: I have no job and no papers” he told Amnesty International. Only 11 Eritrean and Sudanese nationals have been granted refugee status in Israel since 2013. According to the Israeli government, 1,749 Eritrean and Sudanese asylum-seekers were deported to Uganda between 2015 and 2018, including 630 people in 2017 and 128 people in January-March 2018. The Israeli High Court of Justice is currently hearing a case on the legality of the deportations of Eritrean and Sudanese asylum-seekers from Israel. The Court has requested the Israeli government to provide information in the next few days about its “updated agreement” with Uganda, allowing for “involuntary removals”. The deportations of Eritrean and Sudanese asylum-seekers from Israel are illegal under international law as they violate the prohibition of non-refoulement. This is the prohibition against transferring anyone to a place where they would be at real risk of persecution and other serious human rights violations, or where they would not be protected against such a transfer later. Israel boasts one of the highest gross domestic products (GDPs) in the world, making it one of the most prosperous and wealthy countries in the Middle East. Israel’s GDP per capita is more than 55 times that of Uganda, while Uganda’s refugee population is more than 20 times that of Israel. There is an onus of responsibility on the Israeli government to protect the world’s refugees and accept asylum seekers in desperate need of a home. 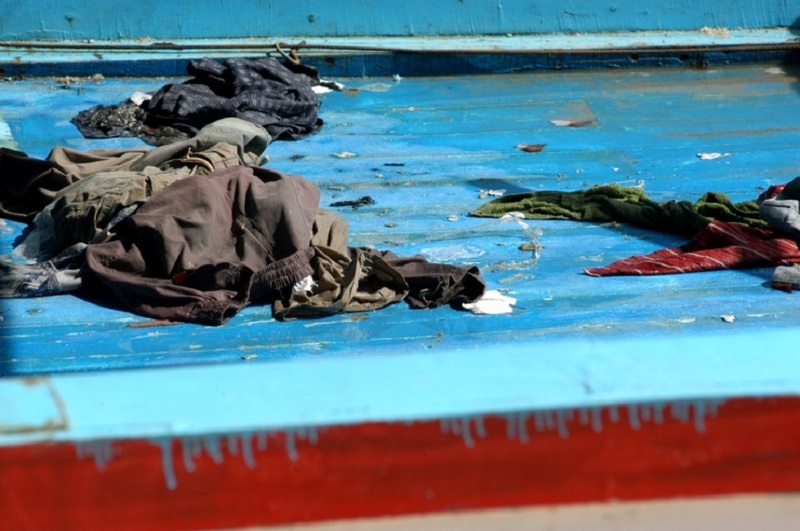 The forced – and illegal – deportation of Eritrean and Sudanese asylum-seekers is an abandonment of this responsibility. It is an example of the ill-thought-out policies that have fed the so-called global refugee crisis. The Israeli government must immediately halt the deportations of Eritrean and Sudanese asylum-seekers to Uganda and grant them access to a fair and effective refugee status determination procedure. Meanwhile, the government of Uganda must immediately cease any co-operation with the Israeli government to carry out illegal deportations. Warsan Shire is a Somali-British writer, poet, editor and teacher. Her poem Home has become a rallying call for refugees. There are several versions of Home online; this one is based on a reading by the author, available on YouTube. Wealthy states and the international community as a whole have failed to equitably share responsibility for managing the ongoing global refugee crisis. In his report In Safety and Dignity: Addressing Large Movements of Refugees and Migrants, published today, UN Secretary-General Ban Ki-moon has proposed a “Global Compact on responsibility-sharing” to create a more predictable and equitable way of responding to large movements of refugees. This briefing urges states to use key upcoming international meetings to move from short-term stop-gap measures to long-term, proactive and globally coordinated solutions. Respect, protection and fulfilment of the rights of refugees in their country of asylum, including the enjoyment of an adequate standard of living, access to education, healthcare and other services, and economic self-reliance. In March 2016, the Israeli army renewed an order designating Al-Shuhada Street and parts of the archaeological site of Tel Rumeida in Hebron city a closed military zone; this order will be in place until at least mid-April. This was done to protect Israeli settlers, who are illegally living in the area, from possible assaults by Palestinians, or so the Israeli army told the media. The military order was initially established at the end of October 2015, following a new wave of confrontations between Palestinians and Israeli forces and settlers, which began in mid-September 2015 in East Jerusalem and spread to Hebron in early October. Under the military order, all entry is prohibited to Shuhada Street and Tel Rumeida, with exceptions for Israeli settlers and Palestinian residents. Notably, the latter must prove their residency and undergo rigorous security inspections every time they pass through a checkpoint. Palestinian men are routinely asked by armed soldiers to remove their belts and shoes, lift their shirts and trousers legs, and remove their jackets. The bags of both men and women are regularly examined. Describing the military order’s impact on Palestinians, one resident of Tel Rumeida told me, “I don’t feel safe. I don’t understand why they do this to us. We have been controlled even in the past, but now I feel that I am not treated as a human.” “Closing the area is preventing me from having international friends in my house. In the military zone you do not see an emergency ambulance, you become asocial, so you don’t think about visitors or birthday parties,” the man added. 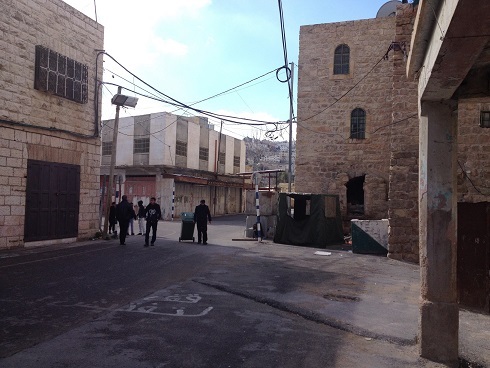 “White line” checkpoint between Shuhada Street and the road to the Ibrahimi Mosque (credit: EAPPI/Sabrina Tucci). Before the military order, Palestinians were still prohibited from driving on any part of Shuhada Street and Tel Rumeida, were routinely subjected to strict security checks, and often had to enter their homes through back entrances or from rooftops, because settlers or Israeli soldiers had blocked their main entrances. Nevertheless, anyone could enter the area, and the situation was relatively easier. Now, international visitors and Palestinians residing in other areas are routinely turned away. Residents of Shuhada Street and Tel Rumeida must register at checkpoints or with the Israeli Civil Administration for a number proving their residency. Those Palestinians who forget their residency number, or whose names are erroneously left off the registry list through no fault of their own, are denied access and forced to enter their homes through fields and alleyways. Whatever the reason, it is both demeaning and outright dangerous to force Palestinians to access their homes this way. “Once I was turned back because the soldiers said I was not registered. They did not let me in but I tried again after a while and succeeded. This is very humiliating,” a resident of Shuhada Street told me. Others have had to endure hostile encounters with Israeli military personnel, including being shouted at or held for questioning. Some Palestinian residents have chosen not to register with the new identification system, as a means of protesting the requirement. Palestinians and Internationals protesting against the military zone in Shuhada Street and Tel Rumeida (credit: EAPPI/Sabrina Tucci). Before October, only some of the nineteen checkpoints between the Old City and the Ibrahimi Mosque were staffed. Following confrontations between Palestinians and the Israeli army and settlers, more of these checkpoints have become operational. 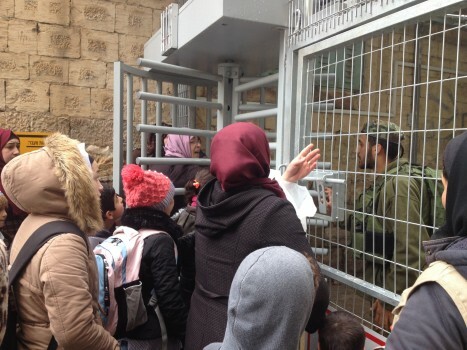 At the end of December 2015, the Israeli military installed a new inspection machine at checkpoint 56, which forces Palestinian residents to go through two turnstiles and a room where they are searched and questioned. The machine also makes security checks lengthier. Checkpoint 56 is in a key location in Hebron. It controls access to Shuhada Street, which leads to Ibrahimi Mosque, and separates the Israeli controlled side of Hebron (known as “H2”), from the Palestinian Authority controlled part of the city (known as “H1”). New inspection machine at checkpoint 56 controlling access to Shuhada Street (credit: EAPPI/Sabrina Tucci). 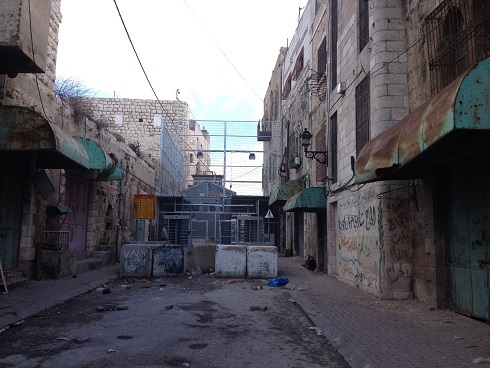 For Palestinians, restrictions on movement in Shuhada Street are not new. The street was once one of the main commercial hubs in Hebron’s Old City. Access to the thoroughfare was restricted for the first time in 1994, after an American Jew, Baruch Goldstein, killed twenty-nine Palestinians and injured more than 100 additional worshippers at the Ibrahimi Mosque. In response, Israeli authorities banned Palestinian vehicles from accessing Shuhada Street, supposedly to prevent possible Palestinian retaliation. Israeli authorities also began limiting Palestinian access to the commercial district, which forced many shops to close down. The 1997 Hebron Protocol, which divided the city into H1 and H2, reopened Shuhada Street to traffic, but not to commerce. During the Second Intifada, access to the area was completely closed off to Palestinians, leading to the permanent closure of Palestinian shops. Since the end of the Second Intifada, restrictions on Palestinian movement into and out of the area have only increased. According to Human Rights Watch and B’Tselem, during this latest round of violence, Israeli forces throughout the West Bank, Hebron included, have systematically engaged in the unlawful killing of Palestinians, who they view as a threat, regardless of whether the threat is real. 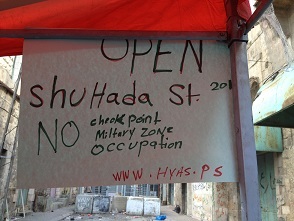 To protest this continuing oppression of the Palestinian community, the Hebron-based Palestinian human rights organization Youth Against Settlements (YAS) launched its seventh annual Open Shuhada Street Campaign on February 20. The campaign encourages people worldwide to pressure the Israeli government to open Shuhada Street and Tel Rumeida to everyone. As part of the campaign, from February 20-28, YAS hosted various events in Hebron, including press conferences, photo exhibitions, film screenings, and memorials. The week’s events culminated on Friday February 26 with a demonstration demanding the opening of Shuhada Street. 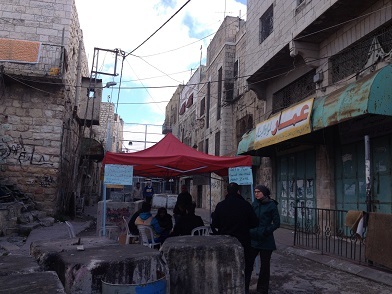 The Hebron Defense Committee, a non-violent movement working to resist the presence of Israeli settlements and closure practices in the Hebron area, also organized a sit in at the north entrance to Shuhada Street earlier in February, to protest the closures. As part of these efforts, the organization launched the Dismantle the Ghetto, take the settlers out of Hebron campaign on February 20, which called for the removal of all illegal Israeli settlements from Hebron and an immediate end to the ‘closed military zone’ order in Tel Rumeida and Shuhada Street. A banner calling for an end to the closed military zone (credit: EAPPI/Sabrina Tucci). The restrictions imposed on Palestinian residents of Shuhada Street and Tel Rumeida have had devastating ramifications on their lives, careers, and health. According to the Ramallah-based human rights organization Al Haq, Israel’s closure of businesses, as well as main commercial and residential streets, has created harsh and restrictive living conditions for Palestinians living in H2. For these Palestinians, going to school, work, or even the hospital is an extremely arduous process. Palestinians attempting to enter Shuhada Street held outside checkpoint 59 (credit: EAPPI/Sabrina Tucci). With Palestinian ambulances prohibited from accessing the area, those in need of medical care must travel on foot from H2 to the Palestinian side of the city. This can be a fatal journey for some. In October 2015, Hashem Azzeh, a well-known non-violent Palestinian activist and resident of Tel Rumeida, died of a heart attack because he could not receive urgent medical care in H2. As confirmed by the United Nations Office for the Coordination of Humanitarian Affairs, movement restrictions, along with on-gong settler violence, reduced income, and restricted access to services and resources, has led to a reduction in the area’s Palestinian population. “This is a way to complete the settlement project and push people out and take over more houses. They want people to leave voluntarily. If this continues, they will succeed,” a man from Shuhada Street explained to me. “People cannot even renovate their houses so eventually they will feel [that] ‘Ok, Khalas’, this is enough. They will leave, if not today, maybe tomorrow,” he said. 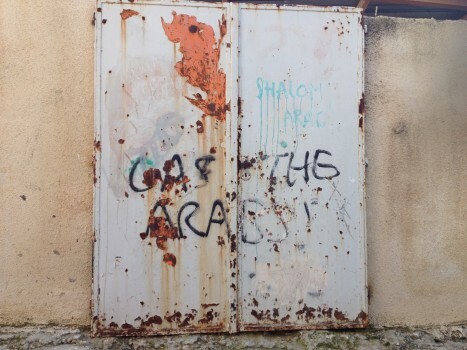 Graffiti on door in Tel Rumedia (credit: EAPPI/Sabrina Tucci). Israel’s restrictions on Palestinians in Shuhada Street and Tel Rumeida violate various principles of international law. 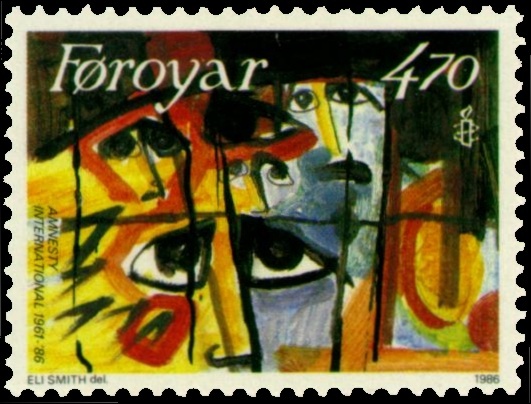 These include the right to freedom without discrimination (Article 2 of the Universal Declaration of Human Rights), the right to freedom of movement (Article 12 of the International Covenant on Civil and Political Rights) and the right to an adequate standard of living and the continuous improvement of their living conditions (Article 11 of the International Covenant on Economic, Social and Cultural Rights). The restrictions, based on the false premise that all Palestinians are inherently dangerous, also violate the prohibition against collective punishment (Article 33 of theFourth Geneva Convention). Israel’s practices in Shuhada Street and Tel Rumeida represent some of its most appalling human rights violations. As many human rights organizations have been asking and as Palestinians themselves are demanding, it is imperative that Israeli authorities fulfill their responsibilities under international law and lift the closed military zone, without further delay. This article was originally published on Muftah. Polish poet Zbigniew Herbert (1924-1998) first included Mr Cogito on the Need for Precision (Pan Cogito o potrzebie ścisłości) in the 1983 collection Report From The Besieged City and Other Poems (Raport z obłężonego miasta i inne wiersze). A commentary on the situation in Poland following the imposition of the martial law on 13 December 1981, the book was published in Paris and did not become officially available in Poland until 1992. Mr Cogito on the Need for Precision is often quoted in works on the role of memory in the aftermath of widespread serious human rights violations (see, for example, this blog post by Patrick Krup). More practically, I like to think about it as a manifesto for accuracy and documentation in human rights work. For additional information on the human rights violations during the Polish martial law, see Amnesty International’s Annual Report 1982 (p280-285) and Annual Report 1983 (p265-270).